Presented by River Heights Pharmacy. Flu Shots available. Please bring your MB. Health card if you are wanting a flu shot. Advent Outreach Project: St. Matthew’s – Maryland Community Ministry Christmas Store needs new or very gently used donations of toys and books for children, and clothing and gifts for all ages to be sold at their church at very reasonable prices. Parents pay $2 per child and can pick out a variety of gifts for their family members and also have them specially gift wrapped. The store operates on Dec. 12, 13, 14 so we need all our donations brought in by Sunday, Dec. 9. United Church Halfway Homes is an outreach ministry of the United Church of Canada, operating 3 halfway homes in Winnipeg which accommodate up to 28 men and women as they transition from prison to independent community living. For the third year in a row, Harrow will be providing gift baskets for 8 female residents (some have children in residence). If you can donate items into the collection box at the church, we would greatly appreciate it. socks, slippers, chocolates, gingerbread house kits, hot water bottles, re-useable water bottles, coffee mugs, children’s books or games, Tim Horton’s gift cards ($5) or 7-11 gift cards ($5). The 2nd Sunday of Advent: We will host a Write for Rights event. 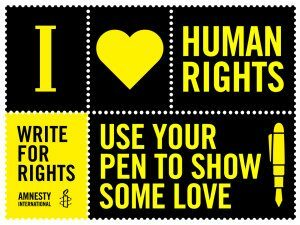 Amnesty International is inviting you to help change lives on December 10, International Human Rights Day, with the world’s biggest grassroots event for human rights: Write for Rights! Harrow United Church will provide cards and writing materials, plus profiles of people on whose behalf we will send letters and cards to. Write for Rights is a public event open to everyone! Materials will be available from 10am to 1pm. You are welcome to attend Worship at 10:30am but are not required to do so in order to participate in this event.